Latvians are going to the Rotax global competition "Grand Final"
Also this year, Latvian riders all season long fought not only in various Latvian karting stages, but also the Rotax Challenge Cup stage. 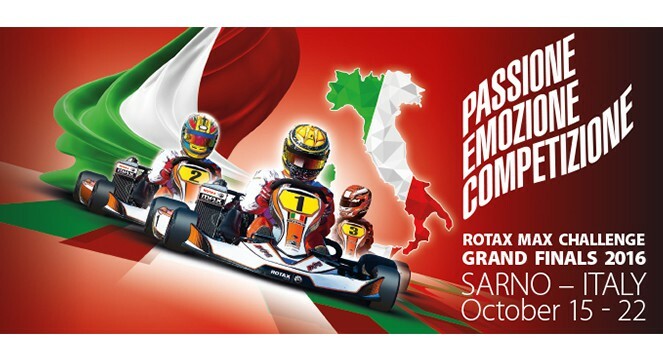 Victory in MicroMax, MiniMax, DD2 and DD2 Masters classes resulted in the standings with a ticket to the "Grand Final" competition, which will take place in Sarno, Italy from 15 to October 22. - Matīss Maļinovskis (MicroMax class) ticket winner Tomass Štolcermanis renounced his ticket to competitions. - Leo Cabulis (MiniMax class) ticket winner Mikus Jasevičs also concerned from the resulting ticket. - DD2 class will compete in a total of 4 latvian riders, 3 of whom will represent Latvia. Haralds Garkaklis his ticket won in Russia, driving with a Russian license. Latvia will be represented by Mārtiņš Steinerts, Kristaps Gašparovičs (first place in both got Mārtiņš Steinerts, but since he already had won its place in the Baltic Cup, then it is entitled to second place finisher) and Ernests Veismanis, who won his ticket to the Estonian Rotax Challenge Cup. Estonian Rotax Challange cup was open, so it was possible to get a ticket to anyone who participated. - On the other hand, from DD2 Masters class will go to Italy Iļja Aļoškins and Uldis Timaks, because winner of the Baltic Rotax Challenge Cup - Antti Rammo of his ticket also covered. Unfortunately, none of junior or senior class riders qualifyed for the tournament. Zviedris and Makušins the Baltic cup and the cup in front of the Estonian ran two Estonian representatives - Georg Koss and Erich Kuhn. This is why so many riders refuse from the possibility to use your ticket and go to these "Grand Final" competitions due to the fact that in the past these tickets acted as invitations and the same rider did not invest in any extent, its own funds, in turn, now have this opportunity still to be paid almost 2500 EUR, this depending on the class. After a full season played, this consideration for riders and their teams require to carefully consider this participating in competitions, evaluating the financial aspects. It should be noted that based on these races are built on the principle of equality - all participate in competitions with the same chassis and completely brand new, still sealed engines. Technical draw takes place before the tournament. Overall, this idea be regarded as welcome, because it is impossible to blame the technique that deceived during the voyage and theoretically everything is based depends on the mastery of the rider and his mechanic professionalism by adjusting the kart according to the circumstances. Unfortunately, the karts however, that in recent years have significantly deteriorated Rotax engine quality, the doubts as to the realization of basic ideas of race in life. In other words, one of the drivers can be very lucky raffled with technique, but for which it can be paid in several places of the tournament table. So far, Latvian athletes' greatest success in this competition is Konstantīns Calko won second place DD2 class in year 2012. Let us keep our fingers crossed for Matīsu Maļinovski, Leo Cabuli, Mārtiņu Steinertu, Kristapu Gasparoviču, Ernestu Veismani, Haraldu Garkakli, Iļju Aļoškinu and Uldi Timaku! Good luck guys both technical draw, both fighting on the track! Thanks to Dr.Kumola for helping me get my wife back, My wife started acting very weird, every little thing she gets angry and one day she wanted to move out. She finally moved out and since then things have not been easy for me I can't lie, until I saw an advert of Dr.Kumola and how he helped people. I wrote to him on his email (Dr.Kumola_lovespell@outlook.com) and told him I did all the Spell caster told me, My wife came home 2 days later we talked about all that happened, she said she did not know what got over her. We are back together Thanks to Dr.Kumola his email (Dr.Kumola_lovespell@outlook.com), he is a great Spell caster..
Visi malači, kas piedalījās! Cīnās kā var un cik ir iekšā!